Plumb roles abound in new shows at the Milwaukee Rep and Renaissance Theaterworks. And Dance! Why? Because the new year is upon us, and the city’s dance companies aren’t forging ahead. Gina Laurenzi’s company teams with the jazz-improvisational trio Twin Talk in performances of new dance work and new music. And for the bold in spirit, Andrea and Daniel Burkholder offer the second installment in their series of nomadic, outdoor dance performances. Check the Sunday weather forecast and send an email to find out where you’ll be spending your Sunday morning. Why? Because the early 20th century is the place (or time) to be–at least according to this imaginative program with Stravinsky’s Firebird ballet as its centerpiece. Conductor Christopher Seaman pairs the iconic Firebird Suite with music from the seldom heard ballet by Paul Dukas—both were written for Sergei Diaghilev’s Ballet Russes. There’s a touch of the Italian with Edward Elgar’s tone poem In the South. And the stellar violinist Karen Gomyo continues the MSO’s nod to Jean Sibelius’s 150th anniversary year, playing his big, symphonic Violin Concerto, Op. 47. Why? Because The Milwaukee Chamber Orchestra has risen again, this time as a collective enterprise with an Artistic Board that includes a Who’s Who of Milwaukee classical musicians—including several leading members of the MSO. The group will perform both small ensemble chamber music and works for chamber orchestra. It calls itself “A Consortium of Musicians Dedicated to an Imaginative Concert Experience” and its inaugural concert features music of Corelli, Vivaldi, Leoš Janáček, and Mozart. Alexander “Sascha” Mandl is the conductor. Why? Because John Pielmeier’s drama premiered on Broadway in 1982, but it’s examination of religious faith and mysticism is all the more robust in the 21st century. A young cloistered nun is discovered in her room with a dead newborn, and a psychiatrist arrives to help decide if she should be tried for murder. Sensational stuff. But rest assured the story’s human dimension will shine through with Renaissance’s terrific cast—Laura Gordon, Flora Coker and Rana Roman. Susan Fete directs. Zonya Love in The Rep’s 2012 “Blues in the Night.” Photo by Michael Brosilow. #1: The Devil’s Music and Of Mice and Men at the Milwaukee Rep.
Why? Because The Rep opens 2016 by taking you back to the 1920s & ‘30s, celebrating different struggles in that turbulent American era. 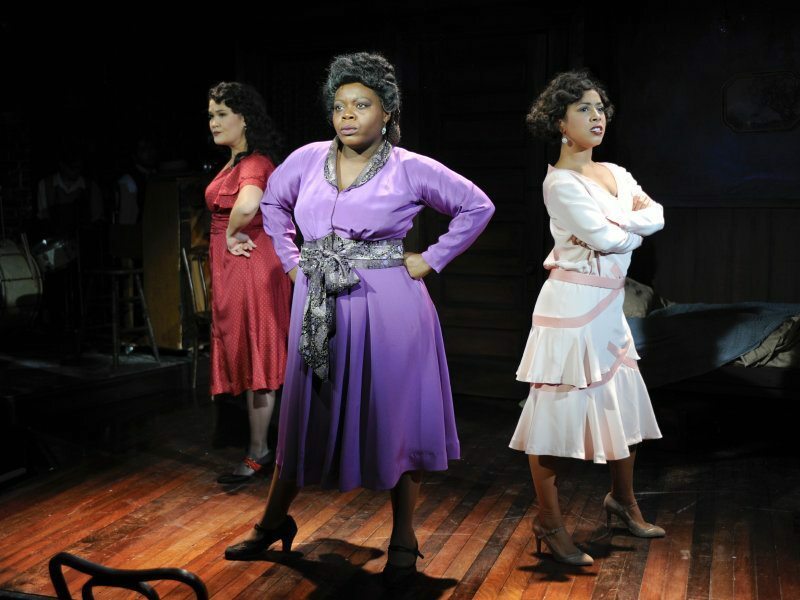 Angelo Parra’s The Devil’s Music is a blues-soaked music-ography of the great Bessie Smith, featuring Zonya Love, the star of The Rep’s stellar production of The Color Purple. Of Mice and Men is John Steinbeck’s iconic story of migrant workers in the Great Depression. The Rep’s Mark Clements’ 2007 Philadelphia production won plaudits and awards, and he’s remounting his vision in Milwaukee with familiar Milwaukee actors (Jonathan Wainwright, Jonathan Gillard Daly, James Pickering) and Scott Greer, who played Lennie in the original Philadelphia production.